A range of great tools, information and technologies are available through Angus.Tech, which can assist in making breeding or selection decisions. When accessing the Angus Database Search, you can enter as either a “Guest” or “Registered User”. The database is available to all members and non-members once they have registered and obtained a log in. Entering as a registered user enables full access to the database and the ability to produce reports, perform advanced searches and customise the outputs of the database. In addition, registered users have access to information not available to users entering as a guest, such as pedigree, ownership and progeny information. This change has been necessitated by the need to protect the integrity of the Angus Australia database. To sign in, visit the Angus Australia website and click on the link at the top of the page “ANGUS.TECH”. 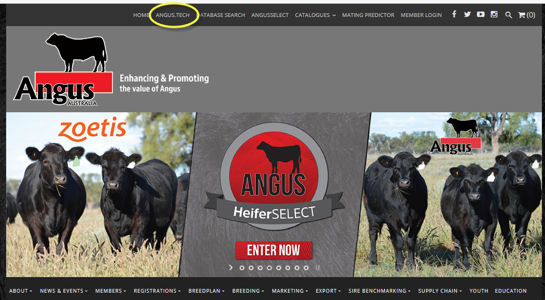 From the Angus.Tech home page click on the “ENTER AS REGISTERED USER” button and enter your sign in details or click “register here” to get your login details. The User ID can be your Herd ID, email or mobile phone number.